Subject: What's next for Mechadrome? Yeah that makes sense, just figured I'd mention it . Sounds like we might finally see Adeptus Titanicus models later this month at AdeptiCon, so you should know soon whether it's too small a scale for you to match. I've been waiting for it to come back for a long time. Some new developments developing! 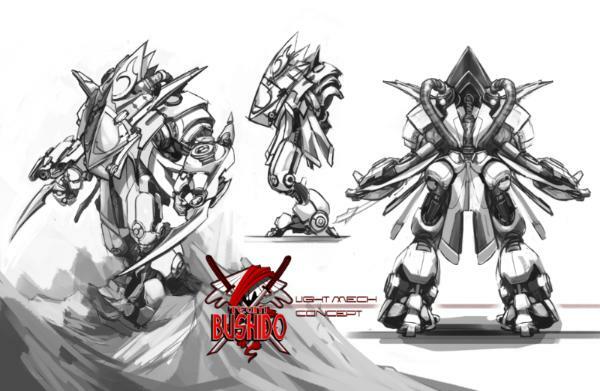 going to be getting the light, medium and heavy mechs drawn up for Team Bushido. Here is a rough sketch for all 3 that I just got. Now he's going to go back and refine and finish up each one. I like how they're still kinda anime looking, but still big and bulky like a mech should be. Woah, those are a bit nuts. Very cool - will be interesting to see how they turn out. I'm still really torn on the model scale. 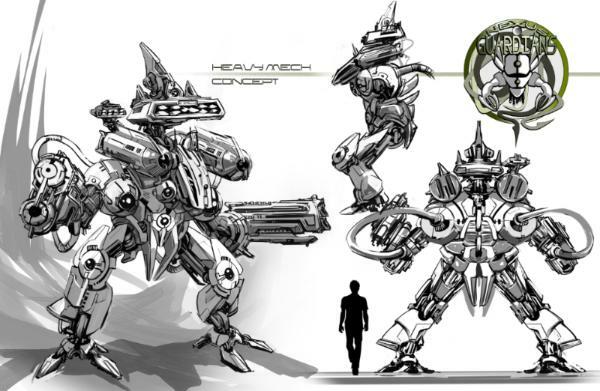 I have a feeling that if I really love the look of all the new mechs I'm gonna want to have big ones to play with. But the only way to make the game affordable at 30mm is to have more of an emphasis on troops or small drones. So now I've been wondering if maybe we could stick with 30mm, and the starter sets would have maybe 1 light mech and a little squadron of 3 drones? Yeah I just think at 30mm the models will be so much cooler. 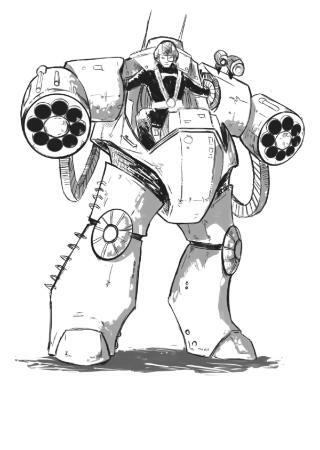 Also I honestly don't think there's a lot of Mechadrome players out there right now, but there were a few that went all in for the first campaign and even if it's just a few I don't want them to feel like they're getting screwed if we suddenly change the scale and make their old models obsolete. I'd feel a little pissy if I were them. So I think adding in some smaller units to make some more affordable starter sets is the way to go. So I'm thinking maying a starter set would be something like 2-3 armored guys or driods/drones, and 1 dreadnought-sized mech. I don't think I backed but I wanted too... can't remember what was going on at that time though. I think it may have been the price point at that time. Does it help to reduce costs by doing a mix of resin and metal? I've noticed that larger resin vehicle kits tend to do a mix. Weapons, weapon mounts, turrets etc are metal while the initial frame/body is resin. 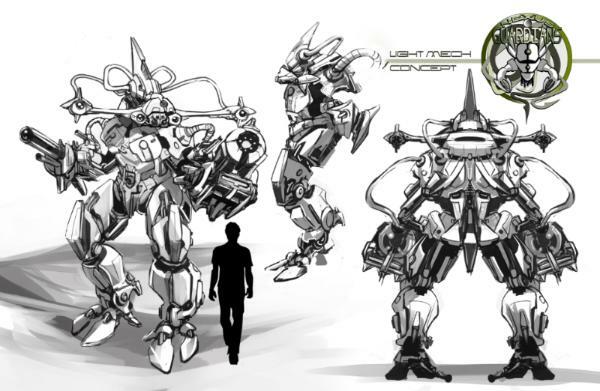 I think I flip flop between liking the aesthetics but most of future scifi games I have, are not as bulky mecha. But I can't really turn away from mecha. I mean robots, mecha! Yeah it wasn't really much of a game back then, and the prices were high but actually not high enough.. costs went through the roof when it came time for production, but I powered through it and get all the models done, but never had to the funds to keep going afterwards. I want to basically do a reboot now almost from the ground up. Even the models I did make will be getting redone and hopefully more posable, but still look the same in the end. The bodies are like all 1 piece right now so I'm going to have my sculptor chop them up a little so they will cast better. The mechs do actually have metal weapons, and I think that's what messed things up for me since I needed so many molds. Some of them were so big and clunky that resin was actually cheaper. So what I'd like to do now is for each team there would be a main mech body, and then you apply different weapon combos for different types.. kinda like how warmachine uses the same body for a bunch of different warjacks. So there will be the one main body, and then I'd like to have more universal weapons so a lascannon always looks like a lascannon and there will be weapon sprues that can be shared among all of the other teams' mechs. And then I could also sell those weapon sprues separately too for folks that want more options. Rules wise the game plays exactly the same as Blackwater Gulch, with the added rules for vehicles and heavy weapons. All my games use the same rules So you will have a pilot stat card and a mech stat card, you can put any pilot you want in any mech you want, so you can come up with cool combos based on a pilots skills and what a mech can do. So I think what I'd do for a starter set is something like 1 mech with squad of 3 drones, so you would get a mech body with 1 weapon sprue either ranged or assault depending on the team. But buying a mech solo model you'd get both weapon sprues. Then I'd have team decks with different pilot and mech loadout cards. Either way it's still a long ways off though. Lots of work to do Pretty much going to be doing it all on the side since BWG is the main focus right now. Subject: Re:What's next for Mechadrome? Thinking aloud here.. still wondering about the format for the 2nd edition. If I do it just like BWG, we would have a rulebook, and 4 starter sets 1 for each of the 4 main teams. Terran Titans, Team Bushido, Nexus Guardians (bionics) and Redsand Raiders (martians). 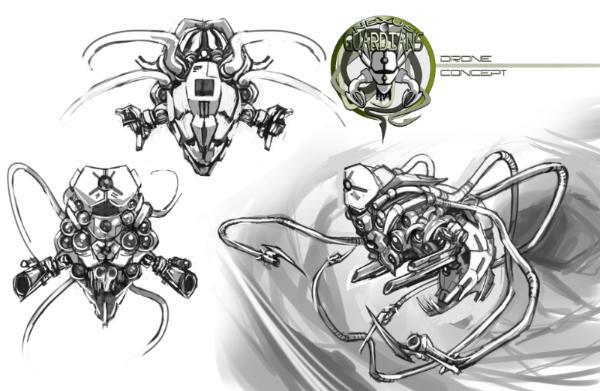 Each starter would be 1 light mech and 3 drones. At 30mm, everything would have to be resin and that means expensive. I think a starter set would be at least $35, probably more like $45, retail price anyway. At 15mm, the starter sets would contain just mechs, maybe 2 mediums and 3 lights, and would maybe cost around $30-$35. I had another idea. I contacted Ludo Fact about doing this as a boxed game. Not a board game, something more like Runewars where it’s basically a 2 player starter set. This would include plastic pvc minis, but I told them right off the bat the detail needs to be at least Blood Rage level. And it would have full rules, tokens and pilot & arena cards. Could maybe also include some cardstock terrain or buildings made out of tuck boxes kind of like Infinity does. This would include the Terran Titans and Team Bushido, and then other factions would get separate starter sets as stretch goals, and different mechs sold separately. I wanted to check and see how going this route would be, since it would make the models more affordable, but I would only do it if they can achieve the level of detail I want. They’ve been making lots of nice minis lately so my fingers are crossed. Only worry is that it would have to be a KS campaign with a very high funding goal, likely $100k or close to it. I kinda think it would be tough to reach, but it could do well if the price is right. I would also have to do a LOT of work ahead of time for the KS to be successful, and that also means a lot of money, which is something I don’t really have. So, just gonna wait and see what they say. This whole project is a long way off anyway, like a KS late next year at the earliest. Looks interesting, might at least need renders for the campaign, though. Still following along here and would definitely back a new Mechadrome! So I’ve flipped and flopped and now I flipped back to the 15mm bandwagon again. It’s really gonna be the only way to go to keep mechs as the focus, and keep the game affordable. I’d still like to do 30mm models, but those will just be resin models that would be done separately. I’m waiting on quotes from a couple of manufacturers, I’d like to try and do it as a boxed game / 2 player starter set kind of like Runewars. So the core box has everything you need to play, and then separately as stretch goals we’d try and do team sets for other races that match the strength of the teams in the starter set. But that will mean PVC models. I’m talking with Ludo Fact, they did the models for Blood Rage so I know they’re capable of having good detail in PVC. The way the skirmish rules work is you have 3 character levels.. Heroes are leaders, henchmen are like the elite guys, and minions are wimpy cannon fodder that form small units of 2-3 models. So we can change that a bit for Mechadrome and have the heavies be the leaders, mediums be the henchmen and light mechs be the minions. So I think we’d probably have starter teams be something like 1 heavy, 2 mediums and 2 teams of light mechs, so 9 models in all. Size wise a light mech would be about the same size as an average 30mm figure, mediums ogre sized and heavies dreadnought sized. For the models I’m hoping to have different bodies for each team, but universal weapons that work with any mech of the same weight class for any team. I think that will help keep the costs down so we won’t need so many molds, and also make weapons easy to identify. Was also thinking, if we can do it as a big boxed set, it could maybe include board tiles where each one is a different city block, and you can arrange them however you want so the arenas will always look different, and also a bunch of fold up tuck boxes that would have different building patterns on them, so you can have a small city to fight over. I think I saw Infinity does the same thing with boxes as buildings. Or would they be too flimsy? 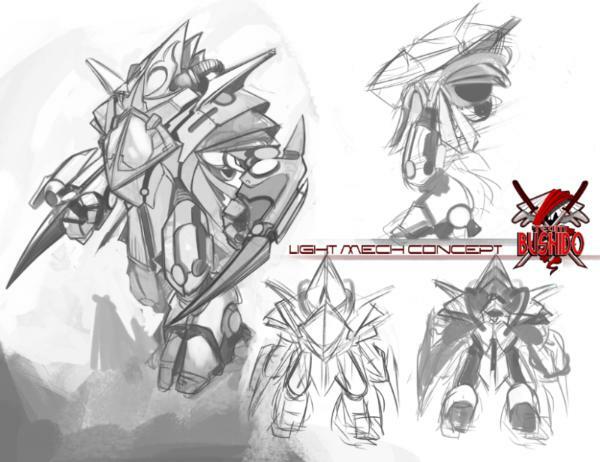 More new concept art Here is the next team, the Nexus Guardians. They are a bionic race that lives on more hazardous planets. 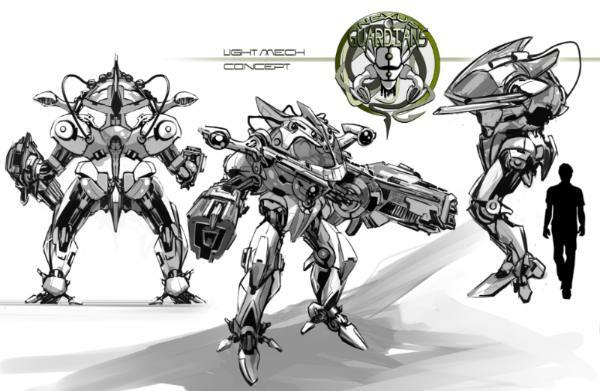 Their mechs will be more thin and agile, not as bulky as the Terran mechs. Oh, and, I’ve been chatting with LudoFact about doing these models in PVC in a big boxed game. Since they did the Blood Rage minis, they’re the only ones I trust to (and know of that can) make high detailed PVC minis. The prices aren’t so bad, for 1000 copies of the stater set I would likely need a KS with a 50k funding goal though. But, it would be a boxed 2-player starter where you still need your own board and terrain, kinda like Runewars. There would just be 22 minis. Each team gets 3 drones, 6 light mechs, and 2 medium mechs. Plus a rulebook, dice, 2 decks of cards and a mini tape measure. Retail price would be like $75. KS price would be cheaper, but I still worry that’s a bit high for what you get. Stretch goals could make it a better value, but the only way to get the price lower would be to produce more than 1000 copies, but that also would crank up the funding goal a lot. Anyway, just some stuff to think about right now. Still lots of planning. Would it be weird to have PVC models in the starter set(s), but metal models sold separately like for special character mechs? I don’t expect to need 1000 copies of them, but that’s pretty much the minimum I have to order for anything in PVC. I'm wondering how those would come out in PVC to be honest though! Will you be able to get a test sculpt and 3D print made (a representative one for each faction at least)? I still don't know if PVC is going to happen. Would be cool, and I'm still planning for that, but will be very expensive and I would want to at least get some models done ahead of time so backers can see what the final product will look like. Some campaigns do all 3D sculpts and can get away with it but I think it's better to at least try and show at least some of the real thing if I can. I'll see how it goes and if I can't make it work there's still good old fashioned metal & resin to fall back on. Instead of trying to stick to specific teams’ mechs and tying them down to one team only, like I’ve been doing.. instead we switch things up a bit and have just “Terran mechs” or Bushido Mechs or Nexus Mechs, etc. Players will just choose whichever mechs they want for their teams, and each one will have different weapons and pilot abilities. There would be multiple copies of each model in the core box, so we would use those colored circle bases that you stick your model’s base into.. like some board games have been doing lately. Each mech would still require 2 cards. You have your pilot card that lists the special skills that pilot has, and then your mech card that mostly just lists weapons. There would be team decks which are just the pilot cards, so you pick your pilots and assign each one a mech to use in the battle. The pilot decks would be included in the core set. Then instead of having models packaged and sold based on the team, they would all be sold separately (aside from what’s in the core box). Like, you would just buy a “Terran Light Assault Mech” or a “Bushido Medium Support Mech”. Each would come with a couple of weapon options. I think going this route, in time, it will allow players to build up more unique teams with lots of variety.. And even if you end up using a lot of the same mechs as your opponent, your pilot’s abilities will also make them play differently too. I’d also have a roster sheet for people that don’t like cards so much. Even if we don’t do PVC, I think just giving pilots access to any mechs they want will still be a cooler and less restrictive way to go. But I think PVC is really the only option if we are going to have a 2 player starter set kind of thing, which I’d really love to be able to do… but it’s gonna come with a hefty tooling cost. What's cooking in your brain these days, Necros . Saw some nice BWG sculpts / updates on your FB page! Right now I'm trying to get the BWG 2nd Edition Kickstarter finished up, getting everything printed now and hopefully will be delivering in November. Then we're planning to do a KS maybe in January for just some new minis, focusing on 3-man minion packs. Mechadrome is kinda up in the air right now, I really want to do it right and take my time with it, so it's probably a long ways off. Still not sure I want to go the PVC route, on one hand I think it would be cool and the models would be cheaper, but lots more expensive to produce. So I thing I would probably do a KS starting out with resin models and only doing PVC if it really took off and I needed 1000 copies or more. 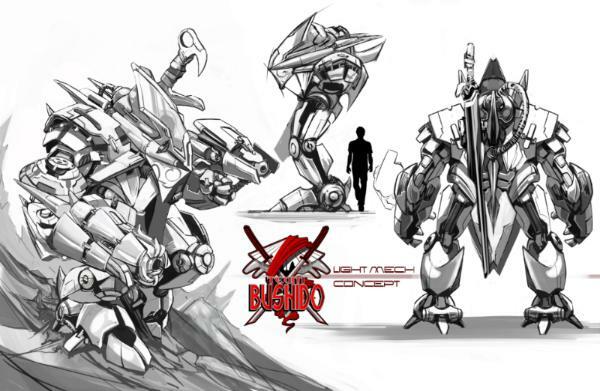 So right now I'm focusing more on BWG, I want to get that up and running with steady releases first After that I will be getting back into the generic ruleset and finishing that with all of the different genres it needs to cover, and then if all goes well maybe Mechadrome can happen around this time next year. I’ve been giving a lot of thought to the format. I keep going back and forth over scale and theme and I was on the 15mm bandwagon for a while, but now I am back to 30mm again. 15mm does make sense for an all Mech boxed game with PVC, but I really want the original modes to be compatible. Some players spent quite a bit of cash on them, and I don’t want them to feel like the models they got from the first campaign are useless now. What I am thinking now is we will keep the current Terran mechs as the kind of universal design that’s available to anyone. We’ll update the models slightly and have the legs and bodies be separate pieces so they will cast better, and maybe slice the bodies in half too. We’ll probably keep the weapon arms as is, but do them in all in resin so there is no metal, since the parts are large it’s better to do them all in resin. 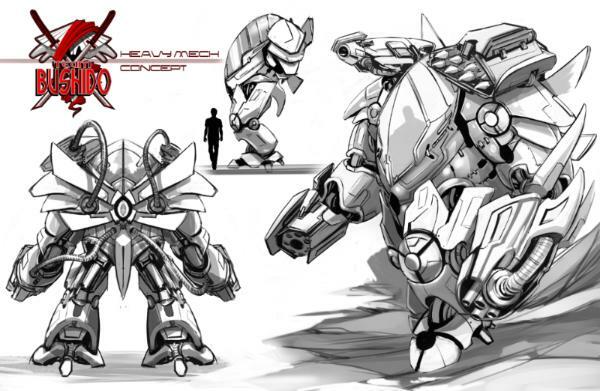 Then, separately, going forward all new mechs will be unique models. We’ll make specific mech models with fixed load outs and cool poses rather than trying to make just a handful of designs that are race-specific. What I want to do is give the game more of a gladiator feel rather than a team sport feel. Imagining in an old gladiator arena, one fighter might be teamed up with another for one match, and the next they they’re forced to fight against each other. The rules will be updated to the standard Gangfight rules used for Blackwater Gulch. There’s 3 different character levels.. minions that form groups/squads of 3 and can combine their attacks, Henchmen are the regular gang members and Heroes are the leaders. 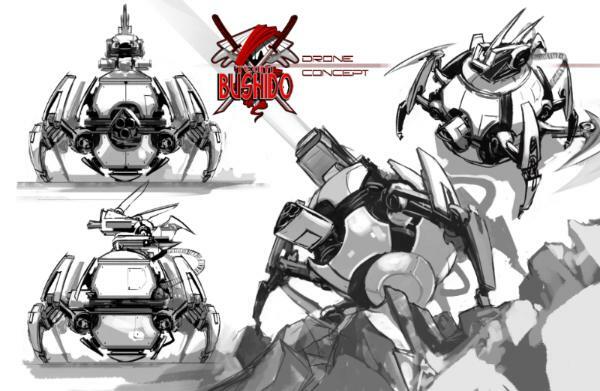 So in Mechadrome, a Hero will be a heavy mech, henchmen will be a light mech, and drones will be like minions. So now that I’m dropping the 15mm scale, that also probably means no PVC. I’ll still look into the costs and see how it goes though, but since I’ll need to be able to produce at least 1000 copies for PVC it might just be too expensive especially since each mech will probably need 1-2 different molds to produce. What I’m thinking I’d like to do is release an updated rulebook, and then just start sculpting some new, original mechs. Maybe releasing 1 new mech every 2-3 months, mixed in with other releases. I think I’d only do a Kickstarter if I needed to make a big 2-player starter set with PVC minis and I worry that it will just be too expensive to do all of the preliminary work and sculpts ahead of time to make it a success.